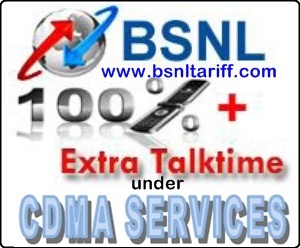 Successful running India’s Telecom backbone Bharat Sanchar Nigam Limited (BSNL) has started Full Talk Value and Extra Talk Value offer under CDMA Services for limited period on promotional basis available across Tamilnadu Telcom Circle (Including Chennai Telephone District). The BSNL Competent Authority of Tamilnadu Telecom Circle has announced 10% Extra Talk Value on Topup Vouchers of Rs.1999 and 20% Extra Usage value on MRP of Rs.2000 above which is inclusive of Service Tax. Full Talk Usage value equal to MRP of Rs.100 to Rs.499 will be offered on Topup Vouchers under CDMA services. The above offer will applicable on Topup Vouchers/C-Topup/Flexi Topup Vouchers. Wherever the usage value offered with topup voucher is more than the usage value offered the higher usae value already offered will prevail. The above offer will be implemented and with effect from 07-07-2013 to 04-10-2013.